By request, this drink is called the Singularity. Yes, I am referring to that singularity. My good friend Andy is getting married, and I am serving the drinks at his wedding reception. The bride and groom have each requested a themed cocktail, and I have been happy to oblige them. Andy requested a drink themed after the singularity. It’s hard to make a drink truly match something as abstract as the technological singularity, but my approach was to pull out some molecular gastronomy and leverage as much technology as possible. In addition to that, I decided to make it seasonal, because peaches are in season, and peaches are delicious. 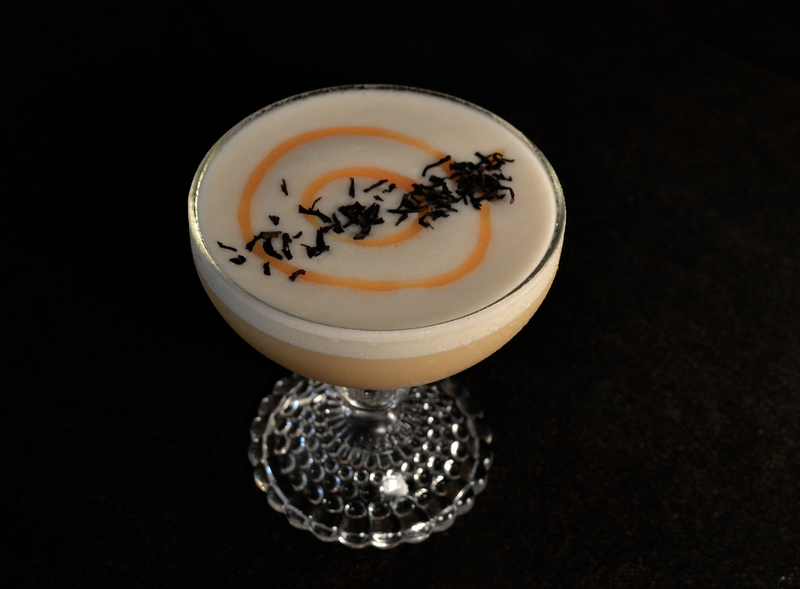 For version one of the drink, I was inspired by this lapsang souchong sour from the lovely Charlotte Voisey. Real talk, I think I have an internet crush on her. Her drinks are fantastic and she has an adorable accent. Anyway, I loved the idea of resting some fragrant tea on top of the foam of an egg white sour. I think it made a beautiful presentation, but in my zeal for aesthetics, I allowed the tea leaves to float too close to the rim of the glass. I then received a sip full of tea leaves. It was not pleasant. I felt that the random fall of the tea leaves resembled Chinese characters, which was intriguing. Moreover, I found that the aroma of the tea was not as strong as I had hoped. My tea was either not fragrant enough or not fresh enough. I used Earl Grey, and infused it into bourbon, instead of into the syrup, because I have had better luck with tea in spirit infusions than with tea syrups. There is a delicate balance to find when infusing tea into spirits. Too long, and the spirit becomes over-burdened with tannin, resulting in a caustic dry mouthfeel. I tested my infusion after a mere ten minutes, and as soon as I began to detect the tannin, I stopped the infusion. Unfortunately, it did not soak up enough tea to find balance against the simple syrup, egg white, and lemon in this drink. Combine all in a mixing glass and blend with an immersion blender. Add ice and hard shake. Double strain into a coupe and top with concentric rings of peach gel and fresh grated cinnamon. For version two of this drink I dropped the tea in order to highlight a flavor that I adore with peaches: cinnamon. In order to emphasize the flavor of the peach, I used peach gel both as a garnish and as an additive to the drink. 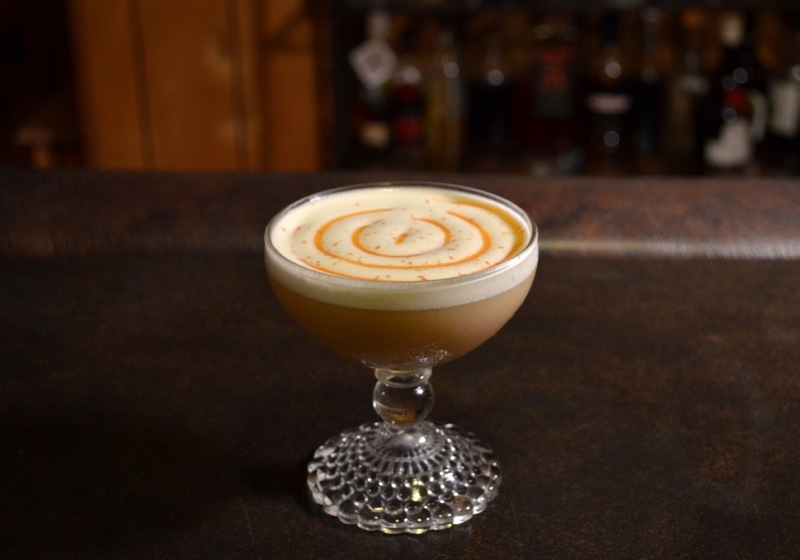 The combination of the gel and the egg white gave it a wonderful velvety texture, while a un undertone of cinnamon formed a foundation for peach and bourbon flavors. A note on method: immersion blenders instantly make perfect egg white foam. I have completely abandoned dry-shaking my egg white drinks in favor of the immersion blender method. My egg white drinks are thick and frothy, with perfect aeration. It’s as if I did a hard, dry shake for two or three minutes! This was the first piece of science in the drink; to use a hand blender to master the egg white emulsion. Ultratex 3 is a modified tapioca starch that swells in water at room temperature. It has good stability at a range of temperatures, and can be used to thicken raw juices up to the texture of a syrup or a gel without heating. I tried mixing it with bourbon to make bourbon with the texture of caramel… it was a little disgusting, but ultratex does wonderful things with fruit juices. This gel will keep in the fridge for about three days. After that, it still tastes alright, but it loses some of its brighter flavors and color, and becomes oxidized. Categories: modern drinks, original creations | Tags: bourbon, cinnamon, cocktail, cocktails, drinking, drinks, egg white, immersion blender, lemon, mixed drinks, molecular gastronomy, molecular mixology, peaches, science, sour, ultratex 3 | Permalink. Thank you. I hope you enjoy this drink. Crazy “alien circles” you made with that peach gel!